… because the Burro Crane has entered service! As previously mentioned, I painted the entire crane with CN Warm Black. This is a great colour, but of course an all-black piece of equipment really benefits from weathering to bring out the details. I used a combination of airbrushing, dry brushing, thinned washes, and weathering powders to finish the Burro. I sprayed some thinned Rail Brown and Concrete around the base and along the bottom of the cab to represent dirt and dust from the road. Thinned washes of Gunmetal mixed with Leather were added to the machinery (winding drums and such) to give it a bit of a shine like old grease. Some rust-toned weathering powder on the roof suggests that the paint has blistered off near the engine exhaust. 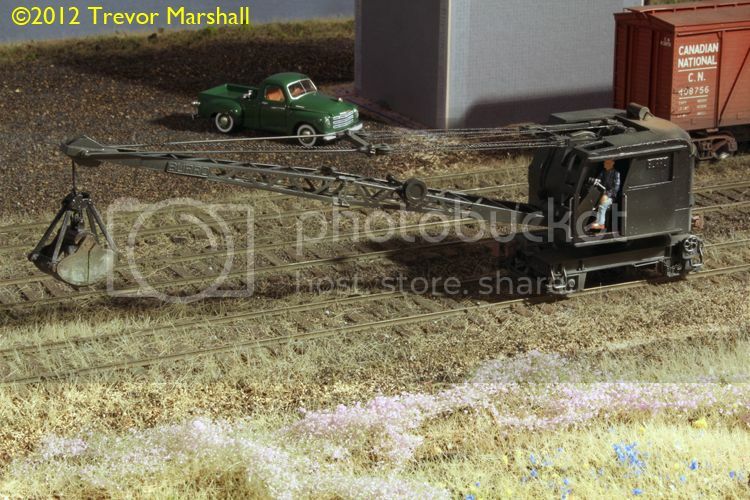 I had to disassemble my recently-acquired River Raisin Models Burro crane to prepare it for painting, so I’ve taken a couple of photos that will help others looking to install DCC in their models. In addition to the slot in the base, it’s also necessary to extend the slot up the adjacent wall of the motor enclosure. The slot in the base allows one to slide the wires into position: When the crane is assembled, the wires pass through the hole in the enclosure itself. I made several passes with a cut-off disc in a Dremel Tool to create this slot and hole. I then cleaned up the hole with another Dremel bit (a metal ball cutter) and filed the slot to make sure there were no burrs. The heat shrink helps protect the wires here too. My friend Pierre Oliver suggested that for my mid-1950s era, an all-black paint scheme is the way to go, so I’ve sprayed the Burro with CN Warm Black – a custom colour offered by the Canadian National Railways Historical Association. It now looks like Darth Vader’s crane: it will need lots of weathering to bring out the detail. I’m modelling the Port Rowan branch in its twilight years, when maintenance wasn’t high on the list – if it made the list at all. Despite this, I wanted some Maintenance-of-Way equipment. It’s always eye-catching and a work train can inject additional operating opportunities into a session. 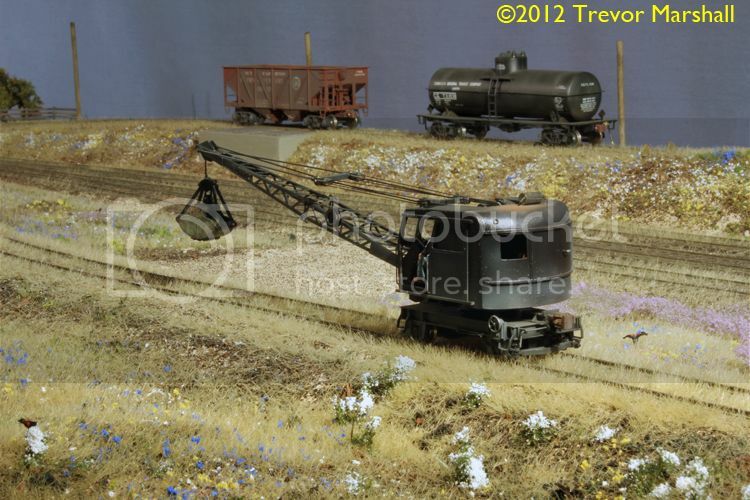 Fortunately, in September 1992 River Raisin Models imported 150 S scale models of the Model 40 Burro Crane. 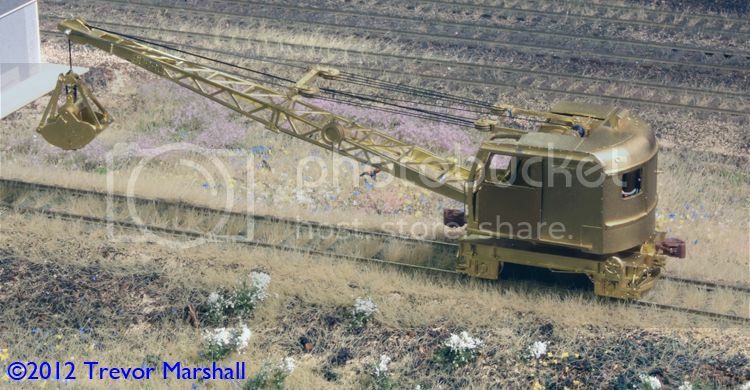 I asked online, and within 24 hours had three offers to sell me one (which suggests that the cranes are not getting a lot of use on layouts). 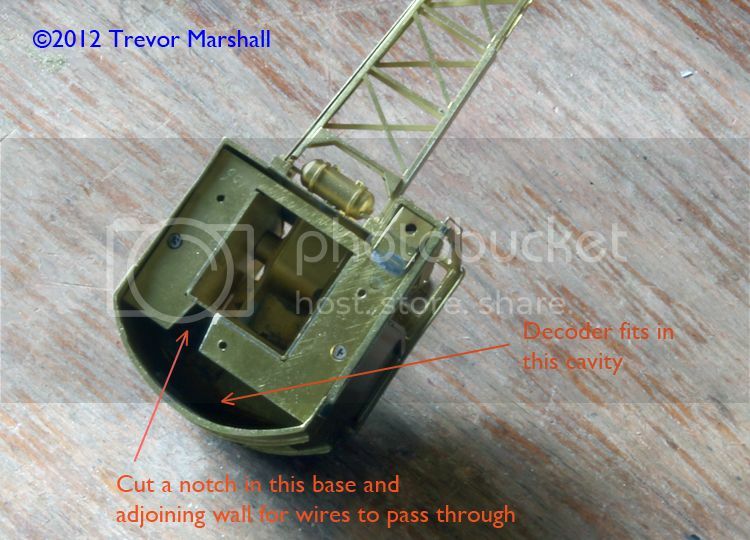 I had to do a quick, minor repair – resoldering one of the upper boom holding arms. I also fitted the model with Kadee couplers instead of the non-operating brass couplers supplied by River Raisin. This was fairly straightforward. The best part is this: I’ve already added DCC – a requirement for running on my layout (and not just because I use DCC – see below). It was surprisingly easy, although it required some care and took about an hour. I removed three screws on the underside of the crane body, which allowed me to lift it off the base. The motor fits into a cavity in the body and stays with the frame/wheels when disassembling the crane, which is a good thing. 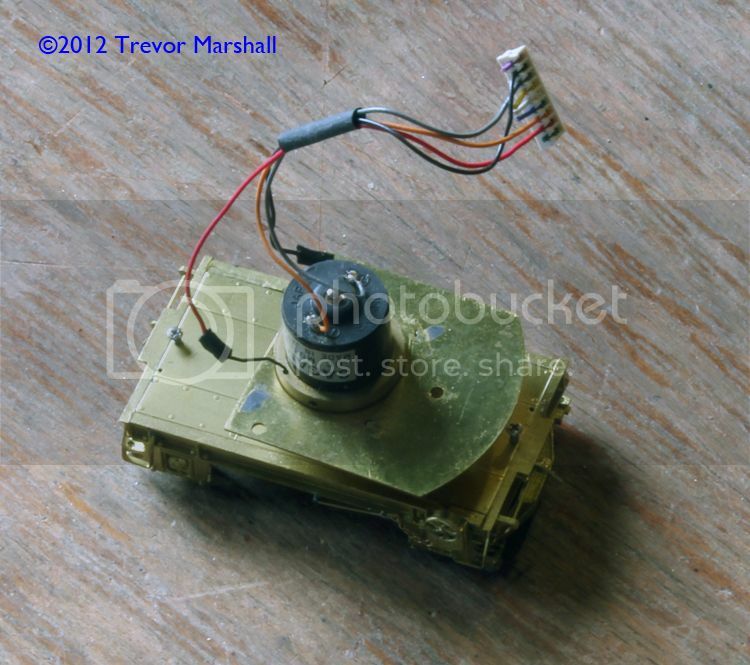 (The base for the body rotates around the motor on a ring.) A wire is soldered from the frame to one motor terminal, while another wire runs from the second motor terminal to a pair of wipers to pick up on the insulated side. I unsoldered these two wires from the motor. I used a cutoff disc in a Dremel Tool to cut a slot in the wall of the box around the motor, so I could pass four decoder wires into the body shell. I enlarged this hole with other Dremel bits and made sure there were no burrs to wear at the wires. For added protection, I threaded my four wires through a piece of heat shrink tubing – left un-shrunk – where they pass through the hole. This means I can no longer freely spin the crane on its base – but since the boom is heavy enough to topple the crane when it’s perpendicular to the track, it’s unlikely I’d do that anyway. I can freely swing the crane through 270 degrees of rotation without any problems, but continuous rotation in one direction would spool the decoder wires around the motor. For my decoder, I opted for a Lenz Gold JST with a Power-1 storage module. This is a potent combination: The Power-1 module supplies power to the decoder when the electrical path from the rails is broken (for example, because of dirty track, or too many static grass fibres between the rails). As it’s a Model 40 Burro, I assigned it the address “40”. 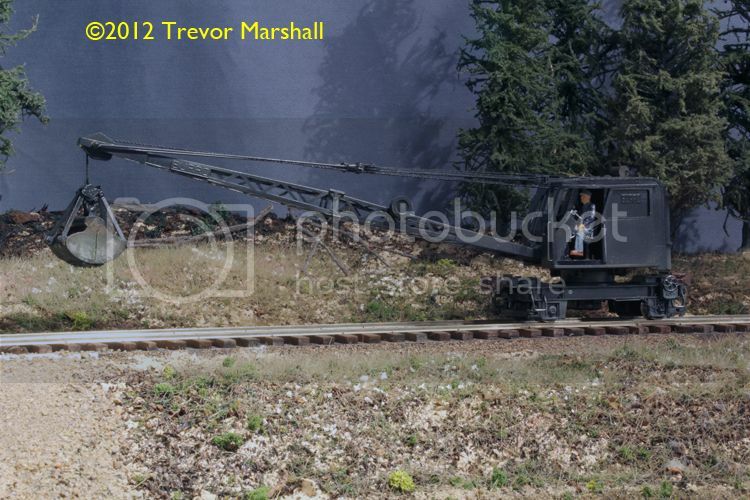 I’m pleased to report the crane runs reliably on most of my track. Switch frogs give it a bit of trouble – even though they’re powered, the crane sometimes drains the Power-1 module before making it across the frogs. I’ll look into that. But it wouldn’t have stood a chance without the Power-1 module. The mechanism isn’t great in these cranes – the manufacturer notes that it’s noisy because it’s geared for torque, not for speed, and it runs better in one direction than the other. That said, this particular example has never been run and I’m sure the performance will improve with proper lubrication and some track time. This project started with a comment from reader Monte Reeves, who noted that Potter Motors in Port Rowan received Farmall tractors on 53′ flat cars. 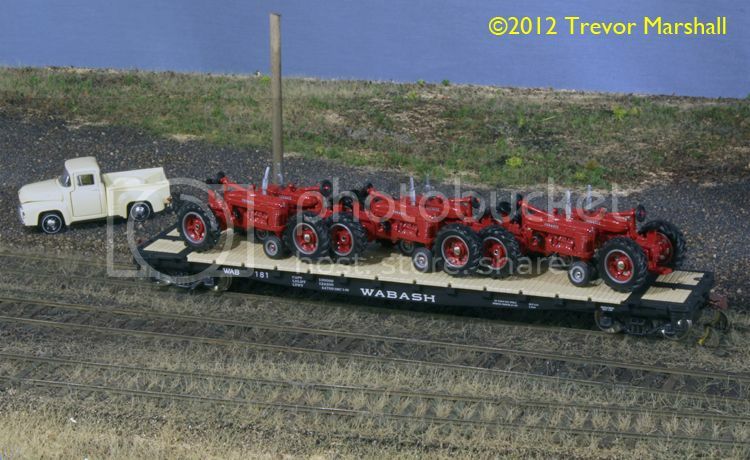 I think a half-dozen bright red tractors on a flat car (the original TOFC?) make a great, eye catching load. In fact, I modelled such a load years ago in HO scale (and wrote about it in the July 2002 issue of Model Railroader magazine). So naturally, I’ll have to do this again. Next steps include weathering the flat car, including the deck, then adding the blocking and chains to secure the load. Here’s a great idea – vintage telephone equipment for your agents/operators. 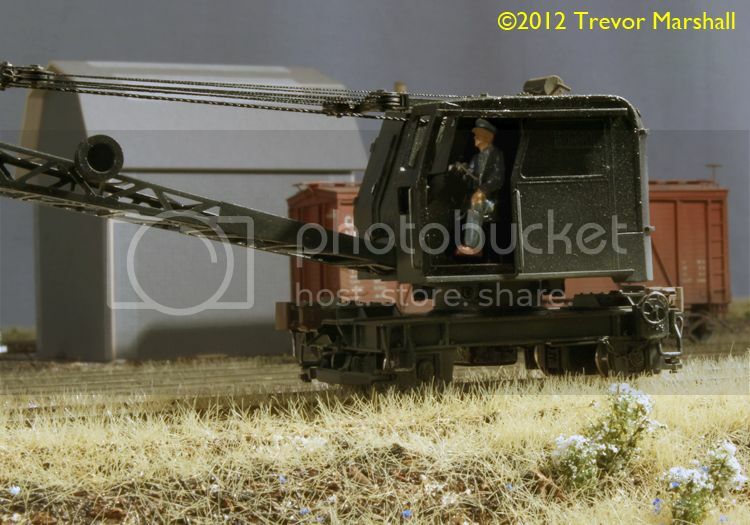 Don Ball describes how he does it on his HO scale Stockton and Copperopolis Railroad. Don pens a most enjoyable blog, too – check it out. Today, I ran trains on the Port Rowan branch using my iPhone. I use a Lenz DCC system for train control. I picked this system because I was introduced to Lenz back in the mid-1990s: Friends in my operating group had Lenz on their layouts. I have always been impressed by the system’s architecture, its reliability, and the ergonomics of its throttles. But I know everybody has their favourites and DCC system choice largely comes down to familiarity. Recently, I received a Lenz LAN/USB interface (Lenz 23151), which I ordered from Tony’s Trains. I’ve always had great service from Tony’s. This interface allows one to hook up a computer to use the Java Model Railroad Interface (or “JMRI”) to perform a number of tasks on a layout. The one I like best is the ability to program and manage DCC decoder settings – particularly useful with sound decoders, which have dozens of CVs to adjust. But the Lenz interface can also be hooked directly to a WiFi router, without a computer. This, coupled with an app called TouchCab, allows one to use an iPod Touch or iPhone as a wireless throttle. A brand new iPod Touch carries an MSRP of $200, compared to $135 for a Digitrax UT4D and $180 for an NCE Cab04PR. So yes, it’s a bit more expensive, but the iPod Touch can do so much more than run trains. I have not investigated the going price for a used iPod Touch but as new models are introduced, with larger capacity for music and apps, there are bound to be some bargains. Since I already have an iPhone, I downloaded TouchCab and picked up an Airport Express wireless router and some cables from my local Apple dealer. It was a five-minute job to connect the cables: An ethernet cable between Airport Express and Lenz 23151, and a standard XpressNet cable between the interface and a Lenz LA152 throttle plug-in panel. I had some trouble setting up the network, but only because I’m not gifted when it comes to troubleshooting computer networks. When I couldn’t get things to work after an hour, I called for help: I jumped online, joined the TouchCab forum, and described my problem. As for the TouchCab – I really enjoy the throttle interface. It’s easy to add locomotives and assign descriptions to each function key, and it’s easy to use the cab in operation. This is not a cab for programming – it’s a cab for running – and it does that very, very well. While I have wired throttles and plenty of plug-in panels, this gives me – and my guests – a robust, wireless option. And … it’s cool! That’s a phrase going around these days. Essentially, it means problems that are nice to have, because one does not have any serious problems – like finding enough to eat or a dry and warm place to sleep. My friend Pierre Oliver visited this week. Before he stopped in for lunch – we went to Harbord House, which is always enjoyable – Pierre photographed some details on an old boxcar to help with a project for his resin rolling stock company, Yarmouth Model Works. And he came face to face with a reminder that even in a wealthy nation such as Canada, people struggle just to live. Thanks for sharing your experience, Pierre: Good reality check! One of the disadvantages of modelling a lightly-trafficked branch – even if it does belong to a major railway system like the Canadian National Railway – is that it can severely restrict the variety of freight cars that should appear on one’s layout. Case in point: It’s highly unlikely that visitors to the Port Rowan branch would’ve seen a Baltimore & Ohio wagon top covered hopper. But I’ve always liked these cement-carrying cars. Years ago, I even built a resin kit for one in HO scale. So when I stumbled across an S scale brass model of one for sale online I snapped it up. I will employ Rule 1 (“It’s my layout”) to justify its occasional appearance on the branch. River Raisin Models imported 158 models of the B&O “N34” class in July, 1993. I replaced the wheelsets with P:64 wheels from Northwest Short Line, which are the standard on my layout. I then lettered and weathered the model. I started with an overspray of gray to fade everything, followed by concrete, white, and grimy black, as appropriate. The lettering is almost obliterated under the grime, although it appears someone has tried to wipe the road number (“630382”) a few times to keep it legible. I’m really pleased with how this car turned out, and grateful that Dan Navarre at River Raisin Models produced this excellent model. It won’t see a lot of use on the branch, but it’ll be a real treat when it appears. I’ve written extensively about trains on this blog (for obvious reasons), and have even written about automobiles – at least, the 1:64 die-cast kind. What’s left? Well, planes, for a start. 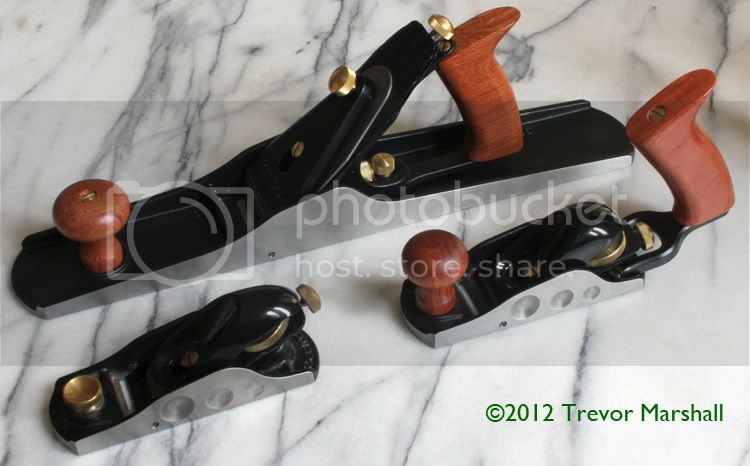 Specifically, hand planes for woodworking – and how they relate to the model railway hobby. My friend Chris Abbott, a regular on this blog, joined me on this course, which was led by Steve der Garabedian from Black Walnut Studio and held in the seminar room at my local Lee Valley Tools. Steve taught Chris and me to build a classic bow saw earlier this year, so we were keen to take another course with him. Chris has written a very good summary of the plane-building course on his blog, so I won’t repeat his efforts except to say that I too thoroughly enjoyed the experience. But once again, I learned many lessons while building my plane, which are just as valuable for my model railway pursuits. First, I was reminded of the lesson of humility. I know almost nothing about wood-working, and when I went into this course I knew absolutely zero about building a hand plane. So, I paid attention, asked questions, checked with Steve before, during and after each step of the process, and generally made sure I understood exactly what I was about to do – and why – before I did it. As a result, I did not make any mistakes. That can’t be said for everyone who took the class. Some worked ahead, on the assumption that they knew what they were doing – only to find that they did not, and needed to rework aspects of their plane. Fortunately, none of the work-ahead types wrecked their project. How many times, though, do we exercise humility when learning a skill for a hobby that we think we have already mastered? How many times do we question our knowledge about how to proceed with a model railway-related task, such as track laying, wiring or kit-building? It’s easy, when the tools and the task are familiar, to fall into the trap of “this is how I’ve always done it”, even if that way is not, necessarily, the best way. Second, I was reminded of the lesson of patience. Every step on my plane took time, and many steps were critical: for example, the bed on which the blade rests can be anywhere from 44 to 46 degrees from the bottom of the plane, but it must be 90 degrees to the sides. Not 89.5 or 90.6 – 90. Sounds straight-forward, but it requires care and precision to set up. It must also be absolutely flat so the blade does not rock. Taking one’s time here – checking one’s progress regularly and working in small steps – paid off. In fact, I did not finish my plane completely: It works mechanically – beautifully, in fact – but I still have to shape the top of the body to make it more comfortable to hold, and trim back the front and back edges to remove the portions of the plane with the wooden dowels. (These were added to help align the two core pieces with the cheeks as we glued up the bodies.) It would’ve been nice to have finished the plane during the time allotted – but I would rather have a bit more work to do on it, than to have rushed my work and botched the job. The goal of the exercise was not Beat The Clock. Yet, how many times do we rush a project in the hobby? For example, how many of us take the time to document our wiring or do a dry-build of a kit before applying glue? How many of us always read the instructions through, from start to finish, and make notes before we tackle any project? Third, I was reminded of the lesson of safety. This is always a good one – but especially when working with power tools. Nobody got hurt – that’s a successful course. But I caught myself a couple of times heading into the power tool shop without my hearing or eye protection. The good news is, I caught myself every time, and went back to my bench to get them. Not everyone was so vigilant. Fourth, I was reminded of the lesson of challenging oneself. Building hand tools is a new experience for me, and it required learning how to use unfamiliar tools and techniques. I feel better for doing this. The same lesson applies to model railways – if we don’t continuously challenge ourselves to expand our skills, we’re doing ourselves a disservice. And fifth, I was reminded of the lesson of pride in building something, instead of buying it. The wood-working hobby – like the model railway hobby – is littered with opportunities to buy things. For woodworkers, it’s tools – and I’m guilty of a few purchases like that myself. But I feel immense satisfaction every time I look at my not-yet-finished smoothing plane. It’s exactly the satisfaction that I do not feel, whatsoever, when I pick up one of the Veritas metal planes in my tool chest – even though they too are beautiful machines. The difference? I didn’t build the Veritas planes. The parallel is obvious in the model railway hobby. We can engage in chequebook modelling – sweeping ready to run product off the shelf into our basket – and build a huge empire. Or, we can build everything from scratch – with a much more modest layout as our goal – and derive immense satisfaction from each element. For most of us – myself included – the truth lies in the middle. But it’s easy to compromise one’s vision for the sake of expediency. It’s easier to buy a kit for a station than it is to scratch-build one, but the scratch-built one will probably be a better representation of one’s prototype – and will definitely be something unique to one’s own layout. Plus, of course, we can point at that station and say to our visitors, “I built that myself”. And that is a great feeling. Recently, Jim King at Smoky Mountain Model Works posted a message to a number of S scale and freight car forums looking for input into future projects for S scale. In an effort to spread the word about this, I’m reproducing the message, below. Please do not vote on my blog site – I’ll remove any comments with votes. Instead, email Jim King with your choices. I created an extensive web page displaying prototype (and 2 HO model) freight cars that I’m considering producing in S scale. 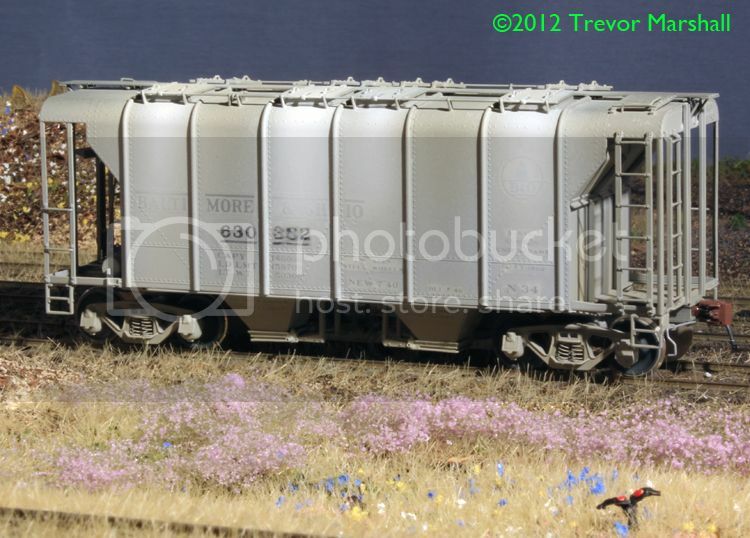 Following the SAL B7 boxcar, the SR 52’6” gon would likely be the first offering simply because the HO CAD files already exist. The PRR X29D could follow soon after the gon (yes, CAD files exist for that too but would take some revision to create the X29B version). The rest of the cars require 100% new CAD work so THESE are the ones where the market interest really needs to be thoroughly understood. The N&W hopper and PS 4750 grain hopper are especially challenging (read: expensive to produce) because of the ladders, steps and railings on the ends. Please look at EACH image carefully .. click on the web image and it’ll link you to a larger image. If you are interested in ANY of these cars or cars not shown, please email me to voice your vote. I will tally a reservation list for each requested car and will sort all from most to least popular. Just remember that 1 image does not indicate other prototypes. All of the cars shown had multiple paint schemes and/or owners, especially the PS-1 boxcars, TTX bulkhead flat and PS 4750 grain hopper (TONS of private owners). These cars span revenue service dates from 1940 (ACF covered hopper) to the present so I’m sure you’ll find something of interest. Thanks, Jim, for continuing to support S scale!